A 68-year-old tuna fisherman from Arisaig, N.S., has died after going overboard on Saturday. RCMP Cpl. Andrew Joyce did not have many details of the incident, but said police received a call at 7:47 a.m. informing them of the man's death. 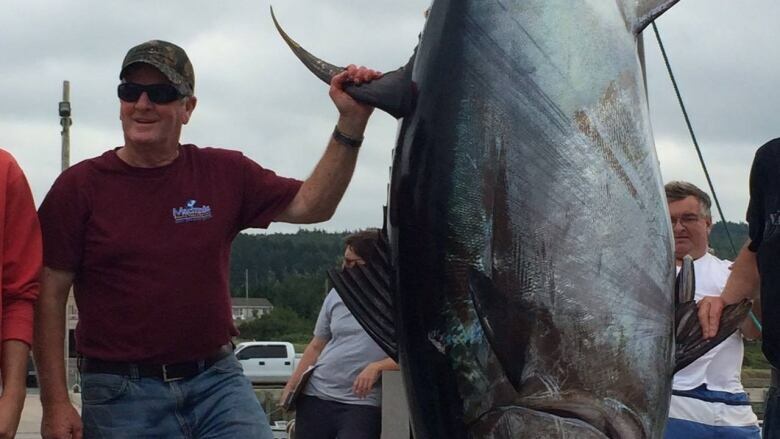 Other local fishermen have identified the man as Stevie MacInnis, who ran a tuna chartering company called MacInnis Bluefin Tuna Charters. MacInnis went into the water near Murphys Pond and his body was brought to Port Hood, Joyce said. The president of the Inverness South Fishermen's Association, Jordan MacDougall, said he understands MacInnis got caught in a net and was pulled into the water. Blaise Boyd, who runs a tuna chartering business based in Antigonish, said MacInnis was on the water with some clients when the accident happened. "Things can happen so fast in this industry," Boyd said. "You have to be always on your guard. I guess you call it a dangerous occupation, but it's a wonderful life and everybody that does it really loves it. "I know Stevie, there wouldn't be anything else in the world that he'd want to do other than fish." Boyd said MacInnis was a "stand-up community guy" and a "top-notch" fisherman. "He was probably the best local tuna fisherman in this area, bar none.… He could catch tuna when people couldn't catch them." MacInnis will be missed in the community, Boyd said. "It was just a terrible accident. You just don't know. You just enjoy every day and hope that you're there for the next one." MacDougall said it's been a tragic year on the water for fishermen, but the industry is trying to improve safety. "We have been getting better on things. We're wearing PFDs [personal flotation devices] and having life-rafts and more training. We have been doing that," he said. "But something like this … just move your foot in the wrong spot at the wrong time and this can result.… You can't eliminate all the dangers." A spokesperson for the provincial Labour Department confirmed a workplace incident happened near Port Hood on Saturday and staff will investigate.